The current story arc concludes as Red Hood comes face-to-face with the crime lord known as Solitary. In a reveal lifted straight from a classic film every comic book reader has seen, we are treated to a non-surprise that Jason – despite being trained by the world’s greatest detective – seems clueless to. But is it a red herring? Jason seems to think so, and is later proved correct. But is evidence of that red herring a red herring unto itself? We’ll see. 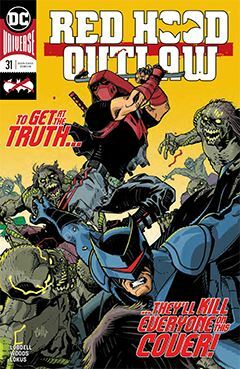 Meanwhile, the Red Hood seems to have found himself a new band of Outlaws: Wingman, a Batman copycat of unknown origins, and Bunker, a former Teen Titan who is equally obscure. And Jason’s dog. And they’re headed for Gotham, despite Batman having exiled Jason due to his extreme measures in crime fighting. I am uncertain of Red Hood’s new partners. Their obscurity makes them ripe for growth, and I applaud the idea of using pre-existing characters instead of creating new, just to fill a role. DC has been guilty of this in the past, (Do we need a Manhunter AND a Martian Manhunter?) so seeing it avoided here is a welcome change. But it seems like a U-turn to the previous format, of Red Hood & the Outlaws. It’s just not Bizarro and Artemis, who have been revealed to be alive in whatever dimension they disappeared to. But I had just settled in to the Jason-Todd-as-Jack-Reacher premise. I’m honestly indifferent to whichever scenario DC Editorial chooses; I just wish they wouldn’t appear so indecisive.